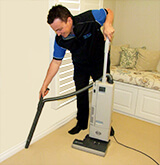 Blog / What Exactly Is Encapsulation Dry Carpet Cleaning, and How Does It Work? Encapsulation carpet cleaning is the very latest development in dry cleaning: designed to give you better-looking, longer-lasting and more hygienic carpets in your home. Dry cleaning carpets has long been recognised by experts as the most effective and efficient way to remove stains, dirt and bacteria from carpets and rugs. And yet even this technology can be improved upon, and with the evolution of dry cleaning encapsulation, MyHome is now able to bring those improvements to you. Traditional dry cleaning relies on four key “ingredients” – temperature, time, chemicals and agitation – used in equal measure. The downside has always been that the temperature and time elements can have a detrimental effect on the lustre and longevity of your carpets. So what exactly is encapsulation dry cleaning, how does it work, and why is it better for your carpets? Encapsulation carpet cleaning overcomes this issue by reducing the amount of time it takes to clean your carpets effectively, and cleaning them at lower temperatures; instead making more efficient use of the chemical and agitation elements in order to restore your carpets and rugs to their optimal condition. The difference between encapsulation dry cleaning and traditional dry cleaning methods can be found in the use of newly developed crystal polymers. You see, dry cleaning has always relied on the use of detergents. These detergents are effective in separating dirt and grime from the carpet’s fabric – but any detergent which remains after the dry cleaning treatment continues to attract dirt to it, meaning your carpets can start to look dirty again soon after cleaning. Encapsulation carpet cleaning still uses detergents (they’re very good at their job!). But the addition of these special crystal polymers means that the detergent is entirely removed at the end of the treatment, so it no longers pulls dirt back into your carpets. Imagine the traditional detergents as tiny magnets that pull dirt towards them. These magnets are equally attracted to the fibres of your carpet – making them difficult to remove once they’ve done their job. That means they continue to pull dirt into your carpet. Now, think of the newly developed crystal polymers as a non-magnetic “wrapping” that seals in the detergent (encapsulating it). The detergent, and the dirt, are now fully encased in a tiny package that does not adhere to your carpet’s fabric, making it far easier to remove. Being easier to remove, the cleaning treatment can now be completed without the need for excessive heat or additional chemicals, in a much faster time. The end result is that your carpets and rugs are left completely clean and feeling fantastic, and they stay that way much longer. Step 1 – We get started with a full traditional clean. That means using specialist tools to remove built-up dirt and grime from all those hard-to-reach places, nooks and crannies and behind/underneath furniture. Step 2 – Individual spots and stains are specially treated. This step is crucial as incorrect treatment of some stains can actually “fuse” them to the fabrics. Our time-served technicians will inspect and test each stain to ensure it is correctly treated for the best results. Step 3 – Application of the Dry-Touch encapsulation crystal polymers which begin to bind around the detergents and grime in your carpets. Step 4 – A specialist “orbit” machine is used to thoroughly massage the chemical polymers into each individual fibre of your carpet, ready for final cleaning. Step 5 – Our technicians will expertly groom the fibres of your carpet in a process called Pile Alignment, which ensures that can treat the whole fibre from root to tip. This process also restores the toughness of the fibres. Step 6 – After allowing the crystal polymers time to work their magic, our technicians return to thoroughly clean your carpet, and tackle any stubborn or returning spots and stains, leaving it in brand new, “showhome” condition. If you would like to know more about encapsulation carpet cleaning, and how our specially developed crystal polymers and Dry-Touch process can bring the life and sparkle back to your carpets and rugs, call us now on 13 22 31 or contact us here.